Fans watching two Class 5A Top 10 ranked teams got their money’s worth on Thursday night at Hallford Stadium as Eduardo Dimas’ goal with 48.8 second to play gave the No. 7 Cross Keys Indians a 2-1 Region 5-5A boys’ victory over the No. 2 ranked Clarkston Angoras. The two DeKalb County rivals battled to a scoreless tie for the first 73 minutes and 45 seconds of play before they combined for three goals in the final 6:15 of the game. Cross Keys (8-1-0) struck first as Edward Owiredu made a nice lead pass to Christian Nandi that broke him open behind the Clarkston defense. Nandi went for the one-on-one opportunity firing a shot past Clarkston goalie Roderique Mihindou for the first score of the game to put the Indians ahead 1-0 with 6:15 remaining in the game. 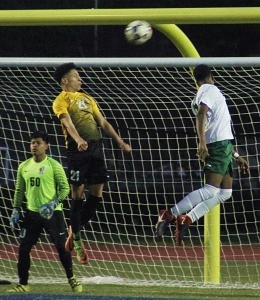 Just three minutes and 11 seconds later Clarkston’s Bismark Dansou guided a pass from Gezai Eta past Cross Keys’ goalie Francisco Ignacio to tie the game at 1-1 with 3:01 left on the clock. Dimas would hit the game-winner as a battle for a header in front of the goal deflected the ball towards Mihindou in front of the goal, but it bounced away towards Dimas alone on the right side. Dimas was opportunistic and as the ball came out to the right side of the goal he punched it past Minhindu for the game-winner with 48.8 seconds to play. Mihindou helped the game remain tied at 0-0 heading into the halftime break with a pair of big saves in the final 10:07 of first half. The first save at the 10:07 mark came as Mihindou managed to block and control a point blank shot in front of the goal. The second big save came with 1:02 to play in the half as Mihindou gobbled up a header off a Cross Keys corner kick. Cross Keys’ goalie Ignacio knocked down and picked up a shot on goal by Gezai Eta of Clarkston who had beat a defender off the left side to get the big opportunity. 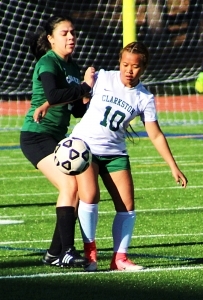 Clarkston falls to 8-2-1 with the loss as Cross Keys moves into sole possession of first place in Region 5-5A play. Maria Pano scored five goals to lead the Cross Keys Lady Indians to a convincing 9-0 Region 5-5Avictory over the Clarkston Lady Angoras in the opener at Hallford. Cross Keys (4-4) got on the board first with 8:15 gone in the first half on Pano’s first goal of the night from out in front of the goal for a 1-0 lead. Three minutes later the lead expanding to 2-0 on a Stephany Ramirez on a shot from the right side. Pano would follow up with her second goal of the night with 19:36 left in the half to make it 3-0. Joanna Hernandez and Adrianna Velazquez would score within two minutes of each other to make it a 5-0 with 13:51 to play in the half. Pano scored her third and fourth goal of the first half with a blast from 15 yards out front of the goal and followed it up with a header off of Velazquez’s corner kick into the middle of the field. Ramirez’s pass to Velazquez with 2:38 left in the first half made it 8-0 in favor of Cross Keys as the teams headed to halftime. Pano hit a blast from 20 yards out front to make the final of 9-0.